pring is here! The Dogwood Festival in Knoxville is preparing to kick into gear as the trees and flowers are bursting forth in bloom. 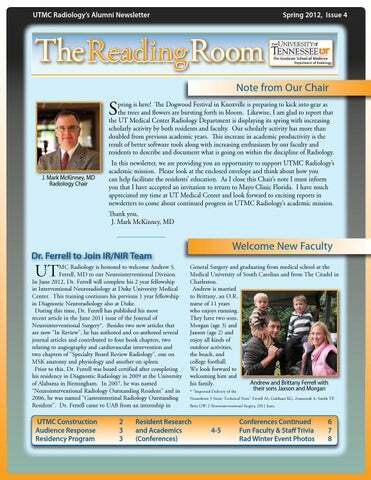 Likewise, I am glad to report that the UT Medical Center Radiology Department is displaying its spring with increasing scholarly activity by both residents and faculty. Our scholarly activity has more than doubled from previous academic years. This increase in academic productivity is the result of better software tools along with increasing enthusiasm by our faculty and residents to describe and document what is going on within the discipline of Radiology. General Surgery and graduating from medical school at the Medical University of South Carolina and from The Citadel in Charleston. Andrew is married to Brittany, an O.R. nurse of 11 years who enjoys running. They have two sons, Morgan (age 3) and Jaxson (age 2) and enjoy all kinds of outdoor activities, the beach, and college football. We look forward to welcoming him and Andrew and Brittany Ferrell with his family. their sons Jaxson and Morgan * “Improved Delivery of the Neuroform 3 Stent: Technical Note” Ferrell AS, Golshani KG, Zomorodi A, Smith TP, Britz GW. J Neurointerventional Surgery, 2011 June. photo shows the final building completed in December. 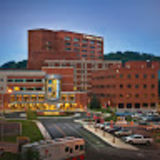 This new patient and staff facility has 6 floors, including roof-top parking, and accommodates 755 vehicles. Completion of the garage was crucial in the staging of construction of a new Cancer Institute (bottom) built on a former visitor/out-patient parking lot. more than double existing space. More than one million dollars of donations for the project was raised in one night at the 4th Annual “Evening in Orange” held last May. Not shown here is another project started in August with a 3700 sq-ft, two-story addition to the Family Medicine clinic and the Graduate School of Medicine building. Note From Our Program Director the faculty to determine areas of strength and weakness. ARS also permits the resident to respond to questions without fear of failure. Using a PowerPoint® format, questions are embedded into the lecture presentation. Questions are interspersed throughout the lecture and using a “clicker”, the resident records their answers. A receiver is inserted into the USB port of the computer and the responses are tallied. Only the total for each response is tallied so it is confidential. It is also possible to assign a specific clicker to each resident and have an individual report created. At a recent ACR course, this was the method for documenting participation in SAM’s activities and to document that each attendee responded to the minimum number of cases. The final documentation from the ACR indicated that the participant had read 100 cases with supervision. ARS is a fun and interactive method for resident lectures and board reviews. The new board format will be computer-based with multiple choice answers. Our future board reviews will be computer-based with images and questions facilitated by the ARS system. adiology research and scholarly activity are vital components of better residency training and future progress. UTMC Radiology needs your support and gifts to help us empower our residents to continue to build upon our academic legacy. We have two funds that both support this crucial mission. in the radiology residency program. The Buonocore endowment honors Dr. Buonocore for his many years of dedicated patient care, devotion to teaching and desire for new knowledge through advanced technology and cutting-edge research. Dept. of Radiology Research & Education Gift Fund This fund was established by interested friends of the Department of Radiology to provide the Chairman and faculty with additional resources to ensure continued excellence in programs of patient care, education, and research. Use your smart phone with this QR Code to quickly donate to either fund! MC Radiology Residents continued a productive 2011 academic year and began a successful start in 2012 at multiple national conferences. Since our last issue, our residents gave seven presentations at RSNA in Chicago, two at ASSR in Miami, and five more at AUR in San Antonio, winning awards and notoriety along the way. Presentations were given in a variety of forms including poster abstracts, scientific oral presentations, and electronic slide shows and posters. Seniors Drs. Cheryl DeWitt and co-chief Amanda Ingram won a “Certificate of Merit” at RSNA and were invited to write a journal article. Senior Nuclear Medicine resident Dr. Richard Laine’s talk at RSNA was singled out by AuntMinnie.com as significant. Newly-elected co-chief Dr. Ted Chang won an AUR Trainee Award (pg. 6) for his poster. We congratulate all of our residents on their continued hard work and look forward to their future successes in the coming year. Poster Presentation: Dewitt and Ingram, et al. Electronic Presentation: Mojtahedi, et al. Oral Presentation: Laine, et al. Electronic Poster: Chang, et al. Poster Presentation: Pirkle and Santoro, et al. Radiology Faculty & Staff Spotlight How Well Do You Know Your Faculty/Resident/Staff Member? Answer Key at the bottom; NO Peeking! 1. At the age of 14 years old, who worked a summer job for 16 hours a day, 4 days a week, making 25 cents an hour delivering milk bottles door-to-door? 2.	Who was the 18 year old victim of a robbery at a Mobil gas station he ran at night in Manassas, VA? The thieves took all the tires for sale on their tire rack! 6.	Who milked Holstein cows at 4:00 am every morning during high school? 10. Whose Hawaiian middle name, “Kahekili”, means “King of the Sharks”?